Since taking over from etisalat Nigeria, 9Mobile has been unveiling some nice data and call offers to its subscribers and the latest is " 9Mobile 10 times recharge" for call and data. 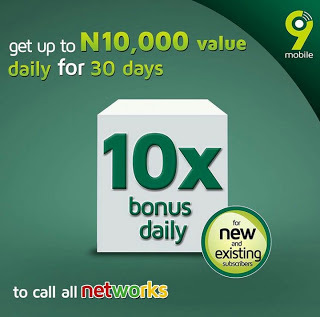 This 9Mobile call and data bonus offer gives subscribers 100000 Naira everyday for the next 30 days and both new and existing 9Mobile subscribers are eligible for this offer. However, new subscribers gets up to 10 times the value of their recharge valid for 30days. Bonus can be used to call all networks in Nigeria. To activate, for new subscribers, simply dail *819*1# and for existing subscribers, you must be on easystarter, easycliq, cliqlite package to get started. Its awesome, thanks for the post!